With a rumble and bright orange glow, a Soyuz rocket blasted off and disappeared into frigid clouds over Kazakhstan on Wednesday to deliver six second-generation Globalstar communications satellites to orbit. 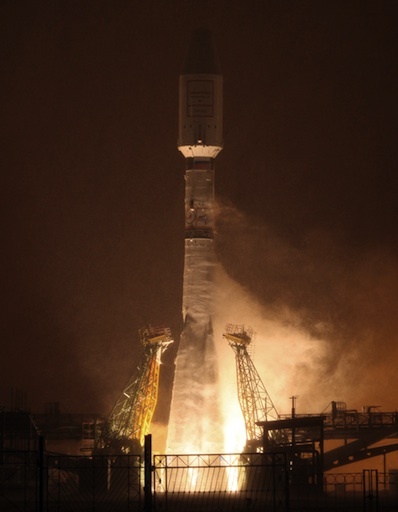 The kerosene-fueled Soyuz launcher lifted off at 1709 GMT (12:09 p.m. EST) from the Baikonur Cosmodrome in Kazakhstan. A blanket of low clouds swallowed the Soyuz 2-1a rocket a few seconds later, but the venerable booster continued downrange, emptying its three core stages in less than nine minutes. The launch was managed by Starsem, an affiliate of Arianespace responsible for commercial Soyuz missions from Kazakhstan. A Fregat upper stage next fired two times to expertly propel the mission's six payloads into a 572-mile-high orbit with an inclination of 52 degrees. 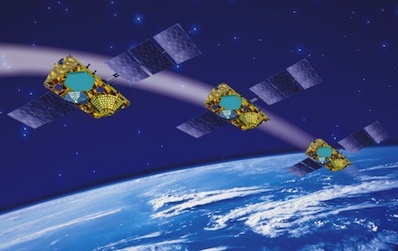 Mounted on a special dispenser, the six Globalstar communications satellites separated in a two-step process, completing the deployment sequence at 1849 GMT (1:49 p.m. EST). The Fregat was supposed to ignite again to de-orbit itself into the Pacific Ocean. Globalstar's subscribers use the satellites to place telephone calls and send data messages around the world. Built by Thales Alenia Space, the second-generation satellites feature longer design lives. Officials confirmed a ground station communicated with the satellites and verified their health following launch. "It's amazing that we can find six satellites within 30 minutes after being placed in space," said Tony Navarra, president of global operations for Globalstar Inc.
Navarra said the satellites were "flawlessly placed exactly where we need them" in post-launch remarks from Baikonur. "I am very proud to share this new success with you because this demonstrates once again that Soyuz, Fregat, the dispenser are the right choice to launch the Globalstar constellation," said Jean-Yves Le Gall, chairman and CEO of Arianespace. Wednesday's launch was the first Soyuz mission since the Dec. 23 failure of a similar rocket with a Russian Meridian military communications satellite. Engineers narrowed down the cause of the mishap to the Soyuz third stage, but final results of the inquiry are still pending. The Soyuz rocket launching the Globalstar satellites uses an older third stage engine. The early focus of the investigation into the Dec. 23 anomaly is the rocket's newer RD-0124 third stage engine. Like Wednesday's flight, Soyuz missions with crews and supplies for the International Space Station also use the older RD-0110 engine. Variants of the Soyuz launcher made their 19th flight this year Wednesday. The Soyuz 2-1a rocket includes a digital control system, which allows the vehicle to fly a larger 13.4-foot-diameter nose cone for commercial flights. Wednesday's launch was the third of four missions to bolster Globalstar's satellite network. Six more satellites are due for liftoff on another Soyuz booster next year, following up on successful flights in October 2010 and July 2011.